On July 1, the man nicknamed “the Hubble Repairman” became a research professor in the Henry A. Rowland Department of Physics and Astronomy at the Krieger School of Arts and Sciences. While at Johns Hopkins, Grunsfeld, who is deputy director at the nearby Space Telescope Science Institute, will continue his research in astrophysics and the development of new technology and systems for space astronomy. “Johns Hopkins University and the Department of Physics and Astronomy have a rich heritage of research at the forefront of experimental astrophysics, including the Hubble Space Telescope. I’m thrilled to be joining the university community and look forward to contributing to the research mission and to participate in the exciting interdisciplinary efforts at Johns Hopkins. With the great team at Johns Hopkins, not even the sky is the limit,” said Grunsfeld. Daniel Reich, chair of the Physics and Astronomy Department, said he is “thrilled” to have Grunsfeld join the Johns Hopkins team and that the former astronaut is already involved in collaborations with faculty members on high-energy astrophysics projects. Considered one of the top space scientists in the nation, Grunsfeld is known as much for his colorful personality as he is for his work in space. The grandson of the man who designed Chicago’s Adler Planetarium (Ernest Grunsfeld Jr.), the Windy City native decided at age 6 that he wanted to be an astronaut when he grew up. While studying for his bachelor’s in physics at the Massachusetts Institute of Technology, Grunsfeld earned $4 an hour and dreamed of going into space while working the graveyard shift in the control room of the Third Small Astronomy Satellite (SAS-3), which was designed and built at the Johns Hopkins Applied Physics Laboratory. After earning his master’s in physics at the University of Chicago, he traveled to Japan, where he worked with University of Tokyo astronomer Professor Minoru Oda. He later returned to the University of Chicago to earn his doctorate in physics, married and took a position at the California Institute of Technology. 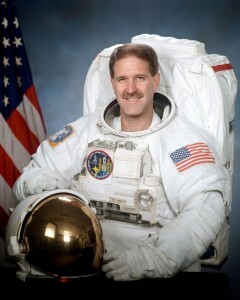 In 1992, Grunsfeld received training at NASA’s Johnson Space Center in Houston, qualifying as a mission specialist. His dream of going into space came true when he was chosen for the space shuttle Endeavour, which launched March 2, 1995, from the Kennedy Space Center in Florida. During the 399-hour mission, Grunsfeld and the crew used three ultraviolet telescopes to study the far ultraviolet spectra of faint astronomical objects and the polarization of ultraviolet light coming from hot stars and distant galaxies. Three years later, Grunsfeld served as flight engineer for the 10-day space shuttle Atlantis mission, which was the fifth ever to dock at Russia’s Mir Space Station. During that mission, more than three tons of food, water, equipment and supplies were moved back and forth between the two spacecraft. While on board the Atlantis, Grunsfeld amused National Public Radio listeners by calling in to the popular car repair show, “Car Talk,” hosted by Tom and Ray Magliozzi. While a student at MIT, the astronaut had taken his 1966 Sunbeam Alpine to the celebrity mechanics (also known as “Click and Clack, the Tappet Brothers”) for repairs, and during the space flight seemed an ideal time to reconnect. “John has the enviable experience of being one of the few humans ever to bring the Hubble Space Telescope to the apex of its scientific capability. We are indebted to him for his perseverance, skill, and unswerving dedication in helping us usher in a bold new decade of exciting astronomical discoveries,” said Matt Mountain, director of the Space Telescope Science Institute. In addition to his adventures in space, in 2003 and 2004, Grunsfeld also served as the NASA chief scientist at NASA Headquarters, where he helped develop the President’s Vision for Space Exploration. Grunsfeld’s adventuring has not been limited to outer space. In 2002, the Hubble Repairman and NASA consultant Howard Donner, M.D., tackled North America’s highest peak – Mount McKinley – as part of a study on how altitude affects body temperature. The research required the men to swallow tiny pill-sized thermometers, which measured their temperature during the trek. The pair, whose efforts were featured in a PBS NOVA episode titled “Deadly Ascent,” reached 17,200 feet before having to turn back due to altitude sickness. Disappointed but undaunted, two years later, Grunsfeld became the only American astronaut to reach the summit of Mount McKinley, leading a team of other NASA explorers.